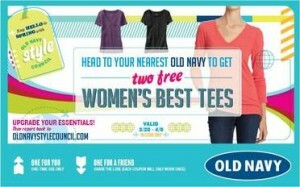 TWO Free Old Navy Tees for you AND a Friend from Crowd Tap!! Apply Now! Crowd Tap has another SUPER HOT action to sign up for!! Hopefully many of you have this opportunity and get selected!! Tee Time Opportunity!! This will include a coupon booklet for you and a friend to each get TWO FREE Old Navy Tees!! Since you love styling it up in Old Navy clothes, you have been selected for a chance to participate in Old Navy’s Tee Sampling! That’s right—you are a lucky member of the stylish and influential Old Navy Style Council who may have a chance to redeem a coupon in-store for two tees of your choice! Get psyched because Old Navy’s selection of tees are great this season! If selected, make sure to share the bottom coupon with 1 of your gal pals so she can get her hands on two tees as well…sorry ladies, you’re not allowed to redeem them both yourself. We know you’re an Old Navy influencer and that if you are selected for this exclusive offer, you and your friend will be able to spread the word about your tee samples! We’d love to see how GREAT you look in your cute new tees, so be sure to post some pics on Facebook, Twitter, & Pinterest and tag Old Navy in them! And, of course, make sure to share your thoughts by submitting a review and some pics of you in your new tees on Crowdtap! Please note, not everyone will have this action it is based on your age and profile. I hope many of you get it though and even if you don’t, Crowd Tap is still awesome!! I’ve been able to cash out a SEVERAL times just from earning money for discussions, quick hit challenges and more. Even better, you get to pick a charity that Crowd Tap will donate money to for your participation! Head over here and sign up. Then participate in the “Quick hits”and discussions to get up to Level 3 or 4, at which point you become eligible for the try outs and will see the application for this activity under “My Actions”. I HIGHLY recommend getting up to Level IV or V as quickly as possible as you will be more likely to be chosen! Let us know if you are picked! Applications for this one are due by March 14. Hi I would love to know how people get picked to try products…. I am on level 9 and when I checked my actions there are none. What a bummer. O well I will keep on tappin.